Are you looking for central government jobs? If you have interested to work in the medical college department, a great opportunity is waiting for you. 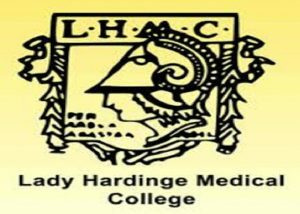 Lady Hardinge Medical College Recruitment 2019 has announced its recruitment for filling the vacancy of 01 post in the post in the labour supervisor. If you are a person with the age limit of 56 years holding an expecting experience, you can able to apply for this job. The eligible candidates have to send their application form in the required format mentioned on the official website. The things to be attached with the application form are also mentioned in the official website you have to go through the information before going to apply. You have to submit your application form to the Lady Hardinge Medical College & Smt. S. K. Hospital, New Delhi on before April 27, 2019. In the, LHMC Labour Supervisor Recruitment 2019 the candidates must hold a similar post on a regular basis either in the parent cadre or in the department. In the level 3 pay matrix, the candidates must have the five years of regular service either in the department or in parent cadre. Alternatively, they must have the eight years of service in the level 2 pay matrix. The candidates must have the capacity to maintain the student leave record, attendance, and their welfare. The job location for the labour supervisor is at LHMC & Smt. S. K. Hospital, New Delhi. The required information about these postings is mentioned in the given below information. The candidates must have eight years of regular service in the level 2 pay matrix (Rs. 19900-63200) either in the department or in the parent cadre. The candidate must pass in the 10+2 examination from a recognized university or board. ·The qualified candidates must have three years of experience in the supervision of Group ‘C’ staff such as monitoring of publicity, deployment, conduct and discipline assessment of performance. They must have the capacity to maintain their leave record, attendance, and their welfare. Step 2: Different recruitment options are available on the official website you have to look for the “Recruitment of labour supervisor in medical college 2019” and click on the detailed information. Step 3: initially, you have to read the advertisement completely and look for the eligibility criteria. If the candidates are eligible and interested to apply for this job means, you have to precede the further process. Step 4: The candidates must have to attach the required certificates along with your application form. You have to send your application form on or before April 27, 2019.